Would You Rather... Predict the Weather or Build a Legal Budget? When my daughters were younger and we were trapped in the car on a long drive, we'd play the "Would you rather..." game. Players must choose between two distasteful actions posed by others, such as "Would you rather eat a cockroach or kiss your cousin?" As the game continues, the choices become increasingly preposterous: "Would you rather dive into a swimming pool full of warm spaghetti or go to the mall wearing a Smurf costume?" If it sounds like fun, well, trust me, it isn't! But in-house lawyers engage their outside counsel in a version of this game every day: "Would you rather submit a legal budget that's probably inaccurate and hope we pay for any overages, or refuse to submit a budget and risk losing the project to a competitor?" And when it's the outside counsel's turn, they pose equally vexing choices to their client: "Would you rather hire a firm with the right experience in this matter but have no insight into the potential cost, or hire an inexperienced firm merely to obtain the lowest rate?" In the children's version of the game, there are no appealing choices. In the legal market's version of the game, it always seems as if the choices favor one party or the other, but never both. This zero-sum approach stems from the belief that legal matters are impossible to predict, that budgets set forth before we begin will always change before we're done. We can't know in litigation whether the adversary will file numerous frivolous motions designed to delay and harass. When conducting M&A due diligence, we can't know in advance whether we'll find leaking underground storage tanks under the target company's headquarters. We can't know whether government regulators will issue onerous new hurdles for regulatory approval. As Prussian Field Marshall Helmut von Moltke said, "No [battle] plan survives contact with the enemy." Case closed. Legal budgets are impossible, right? Of course not! If we extended this mindset to other fields, we'd never be able to predict the outcome of elections (and some do this quite accurately). We'd never be able to assess athletes' potential (and some do this quite accurately). We'd never know whether to take an umbrella when we leave the house in the morning. In reality, there are many fields with as much, if not more, substantially more, uncertainty as legal budgets. "Part of the disconnect stems from different perceptions of the nature of predictability. For risk-averse outside counsel, a client who demands a matter budget before even awarding the engagement is asking for the impossible. For the client, however, creating such a budget is an exercise in the probable." Tim: “I don’t disagree that high stakes matters generate far more concern, but the Deputy GC in his remarks was crystal clear that they will use their own internal resources for certain key litigation tasks, tasks which historically are premium-priced by firms like yours. Just because the overall matter is high stakes doesn’t mean the client will pay premium rates for even commodity tasks. Partner 3: “We enjoyed your talk and are pleased to report that we employ alternate fee arrangements with this client regularly. Trouble is, sometimes we just can’t predict all the outcomes and we’re left with either an unprofitable engagement or an unhappy client when we ask for additional fees. Tim: Alternative fee arrangements aren’t supposed to be win-lose, they’re supposed to be win-win. A well-designed AFA will anticipate multiple outcomes and apply probabilities to each – we call these the optimistic, realistic and pessimistic scenarios. When one of the less favorable or less likely outcomes occurs, it may be unwelcome but it’s not a surprise and the client is generally quite willing to adjust the fee. 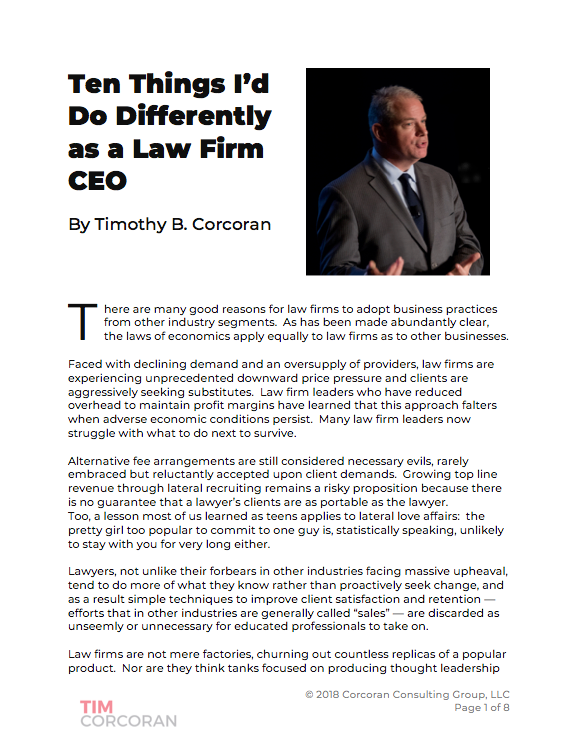 AFAs that assume only one path are most likely to be bad business decisions for law firms. The point isn't that creating legal matter budgets is easy. Of course it's not. But who is better equipped to create decision trees and assess probabilities of the various paths a matter may take than a lawyer who has vast experience? While the changes taking place in the legal marketplace may seem to favor inexperienced low-cost providers, nothing is further from the truth. There has never been a better time for lawyers to demonstrate how their specific experience can add value to their clients. Clients will continue to hire trusted advisors who have their best interests at heart, just as assuredly as the sun will rise tomorrow.